Read the headlines below and read the whole newsletter here. 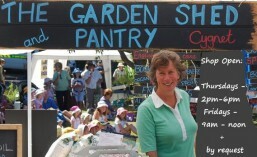 The whole Cygnet market will be outside for March! The Town Hall will be totally surrounded with stalls, front, back and both sides. I need such a big space that I am going to be out the back, next to the Lovett Gallery entrance. This means I can park right at my stall, which will be more wonderful than you can imagine! Please come and see me and please tell your friends! Some of you will know about the endless difficulties Hugh has had working in the very unprofessional environment of the bakery kitchen. The result is that he is no longer working there. Consequently he is able to return to the Cygnet Market this Sunday and bring you all of his masterpieces again. I am not sure where his stall will be but seek and ye shall find! The olive crop at Patlins (and much of SA) last year did not produce as much oil as usual and they have run out BUT I have bought a beautiful oil from Mt. Zero Olives in Victoria, to tide us over to the next season. Frantoio is one of the best and much sought after. Almost everyone here who lives in a house, grows some food, has a few chooks, or maybe has an acre or two to be put to good use. Learning how best to design your space for maximum ease of use, for maximum efficiency, maximum beauty, least harm to your environment and least stress is not always easy. 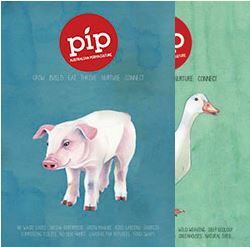 Pip is the magazine of Australian Permaculture and each issue covers a range of topics and ideas from near and far, to help people understand and incorporate practical systems into their everyday lives. It is the only magazine I sell because I think it is the best one for us here in Tasmania. Issue 7 has just arrived. Check it out at the market on Sunday. I will be having my first sourdough and cultured butter workshop for 2017 later in March. Check the dates and make bookings by adding your EMAIL (not your name) here. If you don’t put your email you have not booked, even if I know you!! You will find more information about these workshops on my website here. Thanks for the Wine Bottles but please stop! I rely on my wonderful customers to provide me with wine bottles, which I sterilise and fill with the olive oils and apple cider vinegar I sell. You have been most generous and I now have quite a few. I will let you know when I need more but for now I have enough, thanks. This is just the headlines. Read the whole newsletter here. Seasons in a Wholefoods Shop? Everyone knows that tomatoes are a summer thing and cauliflower is a winter thing but most people are not familiar with the seasons for wheat or almonds or lentils or dried apricots. You may drive through the countryside in winter and see enormous green paddocks then you may drive the same roads in early summer and see the harvesters working in paddocks of crisp brown and still not put two and two together to understand what this means for your pantry. Well let me tell you…..
Glutenous Grains look like grasses (and are grasses) when they are growing. These include wheat, barley, rye, oats and others such as spelt, khorasan and Egyptian Gold. In Australia these are generally sown by the farmers in autumn as the rains begin so they grow through winter, start producing seeds in spring and are dry enough to harvest in early summer or later in colder areas. They are then collected, winnowed (ie have all the chaff and any bits of dirt blown out so that only the seeds are left), graded (ie tested for protein levels, moisture levels, size etc), then trucked to silos to await shipping to mills or overseas. I get most of these grains from Four Leaf, who are organic farmers and millers north of Adelaide in SA. I do get Tasmanian grown spelt and sometimes oats, when I can. Now and again the previous year’s grain is sold out before the next harvest is done. This happens late spring and into summer, depending on the weather. If you shop in supermarkets you won’t know when or where the grain was grown, harvested or milled and this gives the illusion of grains (and flours) not being seasonal but grains begin to go rancid the moment the grain is broken, so old flour, rolled oats and others are, in my opinion, dangerous to our health as rancidity is a known cause of cancer. Moreover, rancidity cannot easily be detected in flour, by humans so buyer beware! Seeds…. sunflower, millet, quinoa, buckwheat and more, are grown in various parts of the world but organic Australian farmers grow few of them so I often run out between seasons. I refuse to buy any grains, seeds, lentils etc from overseas as the amount of fuel required to ship all these around the world totally negates their organic certification and all this shipping is a major cause of the pickle we are now in, with climate change. My customers must learn to eat seasonally and this includes wholefoods! Lentils, chickpeas etc are the dry seeds of annual bushes (like beans or peas you may grow in your garden and let dry off to keep some to plant the next year). Like with such beans or peas, gardeners will know how long it takes for those darn seed pods to be brown and crisp and the seeds inside dry and hard. So it is the same with lentils, chickpeas etc. Harvest can be mid to late summer or even into early autumn some years. Thus I currently do not have the new season’s lentils or chick peas in stock and the previous season’s have sold out. This is the life of a small, organic, Australian wholefoods shopkeeper trying to keep her customers both happy and healthy! Nuts come next in the year, ripening in early autumn but then requiring hardening off before the flavours develop and the nut inside the shell becomes hard, instead of soft. Many customers do not want to crack open the shells of almonds, for example, so I have to wait for the farmer to have his nuts cracked and, because he grows the special and delicious Johnston and Somerton almond varieties only, he does not want his batch thrown in with anyone else’s so he has to wait until last at the nut mill! Hence I will not have any almonds until July!! Last year there was a total crop failure due to a hail storm just at flowering time so my customers had no almonds at all. Thankfully there are a lot of walnuts grown in Tasmania so I never seem to run out of them. I have to get hazelnuts from Victoria or SA from time to time but sometimes I still run out before the next season as I aim to sell organic ones or from farmers I know but who are not certified organic. Dried fruit is a similar story, as I get organic, sundried apricots, pears and sometimes plums from just one grower because I know of no-one else who uses no chemicals, no preservatives and no electricity! I rang her a few weeks ago to confirm my order and she told me there had been a hail storm in November, which had never happened before, and almost all the apricots were damaged! Oh no, I still don’t know if I will get a supply from her. Fingers crossed! The apricots should be ready soon, then the plums and lastly the pears, some time in autumn. Rice is usually harvested some time in March or April. The rain fed, organic, bio-dynamic, aromatic rice I buy is from northern NSW. The farmer uses no irrigation; only rainfall. In doing so he does not need dams or pumps or electricity but does rely on nature. He may get a smaller crop if things are not right but so far he has not let me down although once he ran out before the next harvest. We both do our best! I get organic raisins, sultanas and currants from a grower in The Riverland who only grows these grapes….. did you know these are all grape varieties? Sultanas (Sultanina, Thompson Seedless, Kish-mish), Currants (Zante Currant, Carina), Muscat Gordo Blanco (Muscat of Alexandria), and Waltham Cross (Rosaki, Dattier, Regina, Malaga). The dried fruit of the last two is collectively called raisins in Australia. Last year their sheds and offices were damaged in floods but, luckily, most of their crops had been harvested and moved to a warehouse in Melbourne. Phew. I didn’t want to have to tell my customers that even more of my products were not available! Pumpkin seeds take ages! There is only one pumpkin seed grower in Australia, that I know of and they are in Victoria. They are a small, family group who run a fabulous and very ethical business. It is well into autumn and as late as May before the new year’s pumpkin seeds are harvested and dried. So far, so good. Lets hope it stays that way! Olives are the last, being harvested for oil in about May and pickled at various times from May onwards through winter. Sometimes the olives have more oil, sometimes less. Sometimes the trees have more olives, sometimes less. Sometimes things go awry with the weather and sometimes it is perfect! Pat and Lina keep us all in SA olives and oils for as long as they can but this year I am going to run out as the oil olives were drier than usual and there were less jumbo olives on the trees; a double whammy. We are lucky indeed that the floods last year came within about 10cms of the spilling over the levvy and did not burst its banks, ruining Pat and Lina’s market garden and olive trees.What a year for all our growers! Farming is tough. The people I buy from are real people who grow beautiful, organic food which they hope will survive through the months of growth and produce an income for them. As the climate becomes more unstable, their livelihoods are put seriously at risk. Not only that but I am also dependent on them for my income and we are all dependent on them for our food. All these problems happened in 2016. I wonder what will happen in 2017. Whatever happens, you can now understand why wholefoods are seasonal and how, even though they are dry goods, climate and supply and seasons mean so much. These are Michael Pollan’s words and it really is (almost) that simple to stay healthy. I would change it to: eat WHOLE foods, not too much, mostly plants. What I mean is eat foods that have not been processed, like a whole apple, not a peeled one or an apple muesli bar or dried apple rings that have had preservative added. I rarely eat packaged food; I get ingredients and make them into a meal. Simple. That’s what everyone did for all of human history until recently! Don’t you love autumn; when the nights begin to chill, the orchard trees begin to lose their leaves and, hopefully, we get glorious rain to soothe the garden. Mice are starting to look for winter hide outs and birds have finished rearing their chicks. Chooks are starting to moult and it is time to plant out garlic again. Do you ever think of your own body and what it is telling you about all this? Eating seasonal, local ingredients will naturally guide you to eat what you need to stay strong and healthy all year round whereas supermarket shopping will lure you in with bright colours but leave your body confused and irritable. Now and into April is the time to sow all those beautiful Asian vegetables like bok choy, mizuna, mibuna etc as well as European winter greens kale, spinach, rainbow chard etc. Open any health book and it will tell you to eat LOTS of green, leafy vegetables as the days shorten, so right now is your chance to make eating them as easy as picking them from your own garden. I love chicories as, during winter, they each put on a beauty pageant like no other winter vegetable! It is not always easy to find the seeds but once you have them, you will see them popping up in your garden from early autumn onwards, forever, if you leave a few to go to seed. In winter they are less bitter but that bitterness is to be treasured, as do European cultures, because they instinctively know that foraging the hillsides for chicories and other winter herbs brings the strength of the land where they live, into the body. 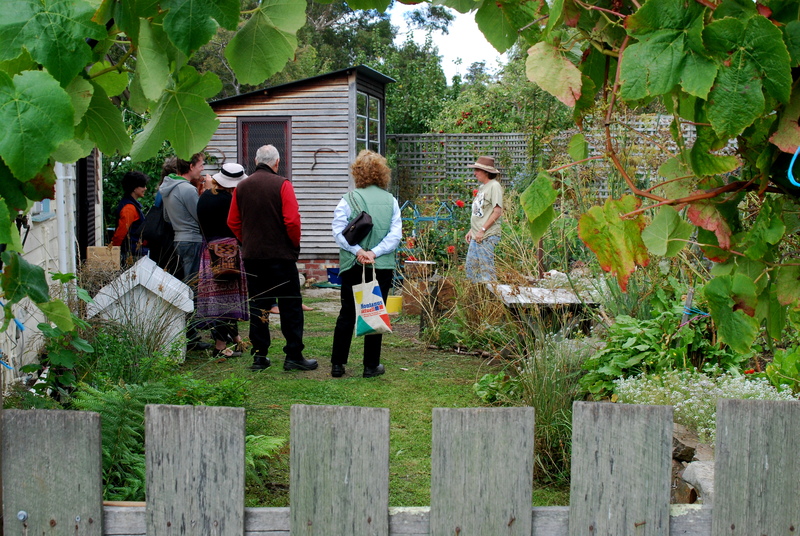 The first of my monthly food gardening workshops will be happening next weekend …. practical, fun and packed with local information (where to get stuff around here, when to do stuff in this area, how to avoid doing too much stuff, what stuff is important and what is not, who to share your stuff with etc etc). Together we will get our hands into the soil and learn while we do a range of activities. Every month will have new topics and experiences. I will help you achieve a productive, beautiful, edible garden to suit your budget and your lifestyle by sharing mine with you throughout the year. Sunday, November 8th, 3pm – 5pm and same time, 2nd Sunday of the month thereafter. Whether you already have a food garden or are just setting up, let me give you some tips to make your garden beautiful, your life less stressful, your food production suit your budget and household, as well as help you use what you grow, all year round. November 8th, 3pm – 5pm. I would like to run monthly kitchen garden workshops throughout the year so you can follow the seasons with me and become comfortable with sowing seeds, raising seedlings, looking after the soil, incorporating nature and native plants, irrigation, managing insects and disease and much more. I have lived in Tasmania now for 5 years and spent a lifetime before that growing food for my family in Adelaide. I started my first vegetable garden when I was 17 and my mother loved using it everyday. My father was a nurseryman and I grew up surrounded by 7 acres of nursery around our house. My mother says I have sap in my veins but I know nothing compared to my father, whose father before him started the nursery. I write the Kitchen Garden Guide for The Classifieds where I can indulge my love of writing, combined with my love of gardening. Growing food and sharing it, cooking it and talking about it are really the essence of who I am. I like to look at the whole picture of world food for humans and spend many happy hours immersed in books to do with the history, geography and anthropology of vegetables. These are wonderful topics for rainy Sunday afternoon workshops! There is a worldwide craze for coconut oil especially for use in hot cooking, such as stir frying. For several reasons I recommend using ghee instead. We all want to do what is right for our body and for our family’s’ health. As people learn more about the effects of high heat on cooking oils, they naturally seek better alternatives and the coconut oil craze has actually caused a world shortage! I only have 10 jars, so be quick! Ghee has been used for thousands of years in India and neighbouring countries where cows are plentiful. Ayurvedic cooking has always recommended ghee for its high nutritional content, very high smoke point, ease of use even for lactose intolerant people and its beautiful flavour. Not requiring refrigeration is another benefit. 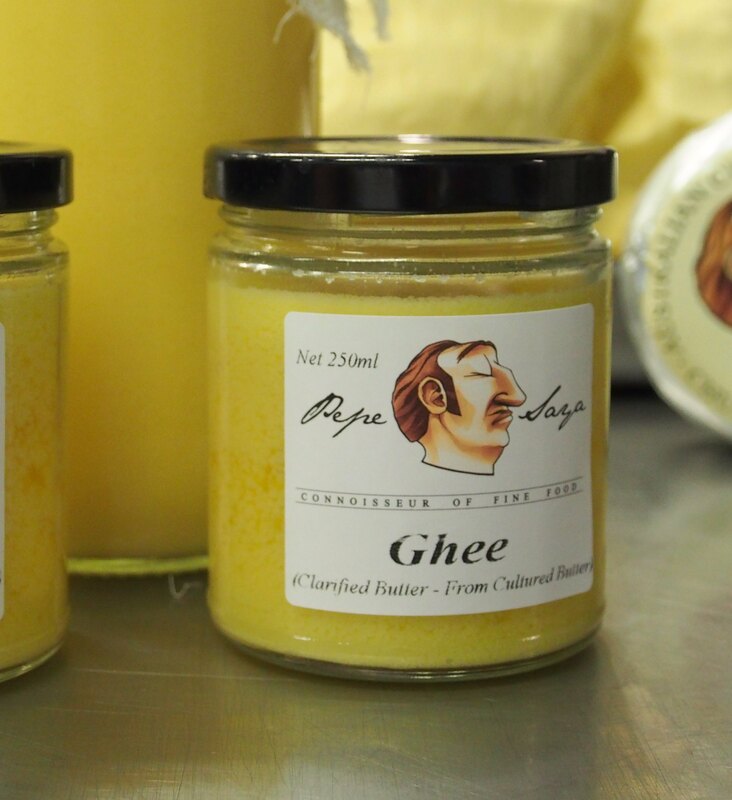 From the Pepe Saya website….Ghee, is clarified butter, which has been simmered until the milk solids separate, it is then caramelised over a low heat, the liquid gold which remains is passed through a muslin cloth to remove any impurities, bottled and there you have it, Ghee glorious Ghee. Ghee is a favourite of those with intolerances to lactose or casein as it contains less than 1% of either of those potentially inflammatory substances, it has numerous holistic applications, can be stored without refrigeration for long periods of time, and is excellent for cooking with its high smoke point of 230c. AND it is made in Australia, so it is also good for lower food miles, for Australian farmers and businesses and reducing the carbon footprint our government refuses to acknowledge! The razor hoe I sell, which is made in England and is a superb quality little hand tool, is now available for left handers. What a great gift idea for gardeners! My seed racks are bursting with new season’s seeds for your garden. I have one remaining heated cable to ensure germination. Ask me about it at the market. Many people have asked me for bean seeds and now I have them. Although I would not sow them in Cygnet yet, where there is still a chance of frost, it is a good idea to get your favourites while you can! Australian Permaculture Magazine Only at GaSP $9.50 Absolutley lovely!